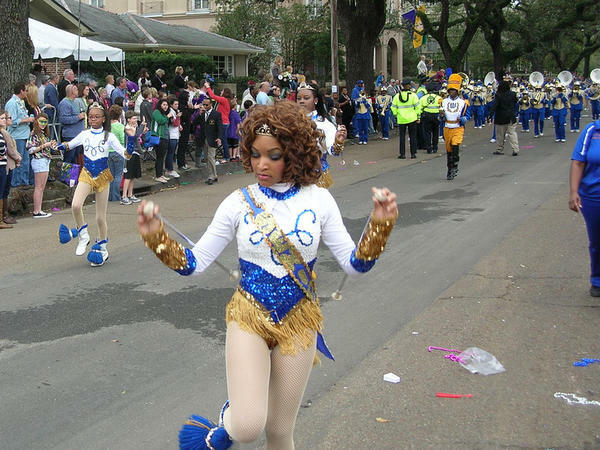 The drill team of Sophie B. Wright, a charter school in the New Orleans Recovery School District. The city's all-charter system is the first in the U.S.
"Twenty years ago, the first state charter laws showed that districts need not run every public school," says Andy Smarick, a senior policy fellow at the Thomas B. Fordham Institute, an education think tank that backs charters. "The RSD is now demonstrating that urban districts may not need to run any schools." Already, about 90 percent of New Orleans schoolchildren are educated in charter schools. There is still the remnant of a local school board. But only five of the 89 public schools in New Orleans will be run by the Orleans Parish School Board next fall. The rest will be operated by more than 40 different charter organizations. Some are part of national chains, like KIPP, while others are run by local community groups. "It's a breathtaking makeover of an urban school system that, before [Hurricane Katrina in 2005], had 120 schools run by an elected school board that was bedeviled by mismanagement and corruption," according to Education Week. Corruption was so bad in the old days that the FBI and other federal and local investigators had set up a satellite branch in the school board's building itself. In response to poor performance, Louisiana's Recovery School District was established in 2003 to take over the state's worst schools. Prior to Katrina, RSD controlled five schools in New Orleans. Its role was vastly expanded following the storm. RSD Superintendent Patrick Dobard announced in December that he would shut down the system's last few public schools a year ahead of schedule. The RSD and its aggressive use of charters has since served as a model for state takeovers of schools in Detroit, Memphis, Tenn., and elsewhere. "New Orleans continues to be the new frontier of school reform, with enormous improvements fueled by the dramatic post-Katrina expansion of charter schooling," says Rick Hess, director of education policy studies at the American Enterprise Institute, a conservative think tank. The public school population in New Orleans has shrunk since Katrina, to about 43,000 students, from 65,000. District demographics remain similar, however, with African-American students making up 90 percent and low-income students about 80 percent of the student body as a whole. Since the storm, RSD students have logged steady gains in math and reading scores. The high school graduation rate is now nearly 80 percent — better than the state as a whole and up dramatically from 54 percent back in 2004. Despite such improvements, the all-charter approach has plenty of critics who maintain there are problems with overly strict disciplinary policies. A civil rights complaint was filed last month against Collegiate Academies, which operates three high schools that had the highest suspension rates in the city last year. Charters in New Orleans as around the country have also been criticized for the perception that individual schools seek to pick and choose their students in ways traditional public schools can't. The city's worst schools are populated almost entirely by African-Americans, while white students disproportionately attend the better ones, according to The Washington Post. In a survey commissioned by Tulane University last year, Anglos and Hispanics were largely satisfied with the city's education changes, but only 29 percent of African-Americans said schools had gotten better. Another 29 percent said their quality was about the same, while 34 percent said they were better before Katrina. "The claim that there is an imbalance is right on the money," John White, Louisiana's superintendent of education, told the Post. "The idea that it's associated with privilege and high outcomes is right on the money." State and local school officials say they have or will implement policies to address all the major complaints about how charter schools are run in New Orleans, including enrollment, discipline and demographic disparities. "The Crescent City is showing what happens when charter schooling ceases being an alternative to the system and starts to become the system," says Hess, the AEI scholar.